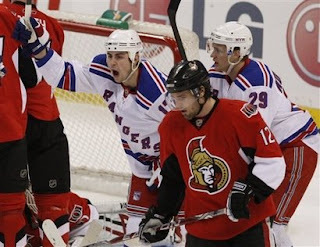 Call it the return to scoring for New York Ranger young'en Brandon "Dubie" Dubinsky, who scored his sixth goal of the season, his first since November 24, as the Blueshirts blanked the struggling Ottawa Senators 2-0 last night in Ottawa. The Rangers are now 25-15-4 for the season sitting in second place in the division, one point behind the raging and rising Philadephia Flyers. But the highlight of the game was watching a flawless goaltender Henrik "The King" Lundqvist who owned the night. This game was in anyone's corner, but Hank took control in goal and made up for his semi-performing blueline (including 'turn over'er Wade Redden). It wasn't until recently benched Lauri Korpikoski scored the game winner midway through the third period, off of an awe-inspiring feed from Nikolai Zherdev. Even on television, the silent Canadian crowd "oooh'ed and aaawww'ed" when Nicky Z deeked their defense with a behind the back feed. The "Amazing Zherdev" is an appropriate knickname for the Russian as half of the time he is invisible and the other half, well....like last night. In other news, to my dismay -- former (2 season) New York Ranger Brendan Shanahan is now officiallly a New Jersey Devil. Last night Lucky Louie of the 'Devils of Newark' finalized Shanny's return, terms not disclosed. Shanny stated again to the press that he wanted up until yesterday to be a NY Ranger, but cap issues got in the way and he had put his trust in NY Ranger GM Glenn Sather to work it out. Not to be. So he comes full circle -- the team that drafted him in 1987 will have another shot with him. Best of luck to you Brendan. I will always be a fan -- you did a lot for the team, but now I have to dislike you. Have fun in Newark!!! "Omsk My God!" - in other Ranger-related news, Jaromir Jagr publicly admitted yesterday that he wouldn't mind coming back to the NHL next season as a Penguin -- and completely willing to do that under the minimal salary requirements (meaning $350,000 per season) as Mario is his mentor and he owes everything professionally to him. Jags could teach a thing or two to The Diver. 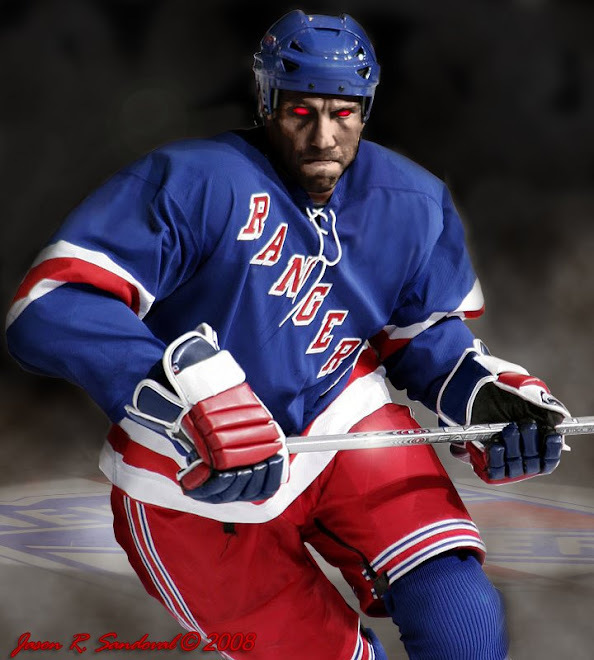 He'd also be killer in line with Malkin. Or not. Tipping the glass for another Hank shutout, another win and the possibility that an offense is emerging. Thank god Jagr kept that house in Pittsburg. 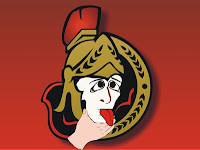 We lack enough conviction with the team we have. One good sulk by Jags and we'd be passing black nail polish around the room and start giving each other emo haircuts. Dark Ranger, Gotta like Anonymous and his humor. Solid game by the Blue Shirts, Lundqvist looked like he was back to normal and the "Kid's" on the Rangers leading the way. As for Shanahan I too am a little sad. Damn, I played against him when he first broke in with the Devils as an 18 yr old(makes me and Shanny old LOL).